A simple scarf made with basic stitches gets a glitzy upgrade with woven stripes of ribbon yarn. 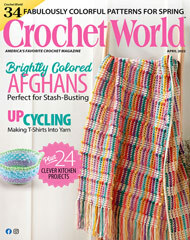 This e-pattern was originally published in the August 2012 issue of Crochet World magazine. Size: About 6 1/2" x 45", excluding fringe. Made with light (DK) weight ribbon yarn, medium (worsted) weight wool yarn and size G/6/4mm hook.